At a mere five ounces, the Leatherman Skeletool has a stainless steel combo blade, pliers, bit driver, removable pocket clip and carabiner/bottle opener. The Skeletool is just what you need in one good lookin' package. Closed length: 4 inches (10 cm); Weight: 5 oz (142 g); Blade length: 2.6 inches (6.60 cm). READY FOR ANYTHING: The Skeletool has everything you need and nothing you don't in one good-looking package. And it's light enough to use as your everyday carry. 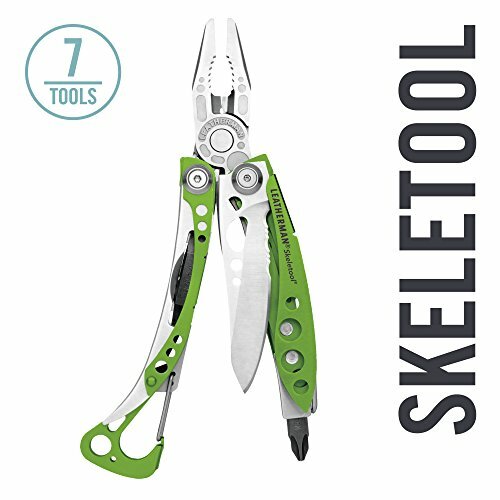 FIT MORE FUNCTIONALITY: The Skeletool is equipped with 7 tools, including a knife, pliers, a large exchangeable bit driver, wire-cutters, and a carabiner/bottle opener. It comes with an extra bit stored right in the handle. LET'S BE PRACTICAL: Sometimes you only have one hand to spare. Skeletool only requires one hand to open and use all the tools, even the ones that aren't accessible from the outside. And with a locking blade, you can cut with confidence. ALWAYS ON HAND: The Skeletool weighs just 5 ounces and is equipped with a removable pocket clip so it's always within reach and ready to work. 13 in 1 Camping Gear, Survival kit, Car Tool Kit in Durable Black Oxide Stainless Steel with Hammer, Axe, Knife, Screwdriver, Saw, Bottle Opener, File, Perfect for Camping, Survival, Hiking, Outdoor.